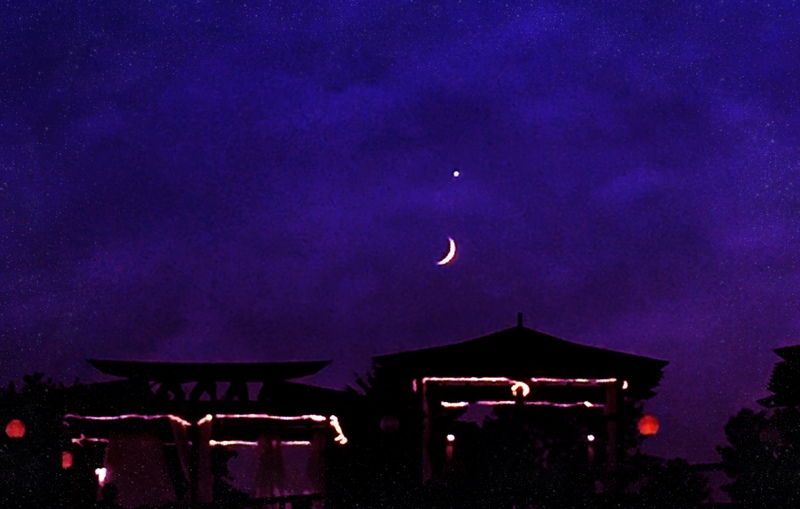 Did you happen to catch the striking view of the Moon and Venus aligned like a semicolon in the western sky earlier this month? Astronomers call it a conjunction when it happens. It isn’t rare, but it is somewhat ironic considering grammar rules dictate a semicolon is never used with a conjunction. Naturally, I decided it must be a sign that I reconsider my relationship with the semicolon. I don’t dislike the semicolon; I never think much about it. Most people don’t understand the semicolon, despite the fact that it is deceivingly simple to use. A semicolon connects two sentences that are related but grammatically independent. It adds nuance and subtlety. It also links lists of items. I would venture to say the semicolon is more popularly used today as a sly wink emoticon rather than as a mark of punctuation. Many writers, you might be surprised to know, have purposefully turned their back on the semicolon. Gertrude Stein felt it nothing more than a pretentious comma. George Orwell claimed it was an unnecessary pause. The late Kurt Vonnegut went so far as to label the semicolon a transvestite hermaphrodite that stands for absolutely nothing. All a semicolon does, he said, was show you’ve been to college. It’s been called “sissified,” “arbitrary,” and “inconvenient” by a slew of writer, editors, and pundits. That’s a lot of hate. It wasn’t always that way. The semicolon was an innovative device back in the day when a Venetian by the name of Aldus Manutius added it to a font set he developed in 1494. Venice at that time was the “Silicon Valley” of the printing world, full of new ideas and commercial competition, mainly because the city recognized and encouraged freedom of the press. Punctuation was needed to guide oratorical pauses while reading books. The comma meant pause and count one. A semicolon meant pause and count two. The colon meant pause and count three. A period meant pause and count four. The semicolon even became chic for a couple hundred years when English writers took it up in the 16th and 17th Centuries. Grammar historians note that writers of the time just couldn’t get enough of the semicolon, or any other punctuation for that matter. Take a look at all the commas and semicolons in Shakespeare’s writing and you’ll see what they mean. The purpose of the semicolon begun to evolve to reflect the joining together of contrary thoughts in the mid-1800s just as it fell out of favor. The Romantic writers and poets of the period were experimenting with new types of prose and fresh ways of expressing themselves. Experimentation was their motto and experiment they did with punctuation. The Romantics used a lot of dashes, for example, to add pizazz and create a way for their thoughts and words to jump off the page. At the same time, technology in the form of the telegraph encouraged people to change how they used punctuation quite simply because each mark cost the same as a full word. Brevity was less expensive. By the early 20th Century, American schoolbooks had begun to encourage boys and girls to use a period between two independent clauses rather than joining them with a semicolon. The semicolon had become downright dowdy. With today’s decreased attention to detail and the rise of new communication devices and platforms, I’m not surprised to find so many observers mourning the death of the poor old semicolon by irrelevance. If you think about it, all punctuation has been relegated to second screen status on our mobile devices. We’re moving so fast we don’t even bother to hit the shift button once or twice to access the punctuation keys. Does this mean punctuation in general is doomed to the same fate as the semicolon? I’m not quite ready to jump on that bandwagon because I see so much of our communication moving towards writing, albeit in smaller electronic bites. Look around at everyone hunched over mobile devices and feverishly typing away. Does anyone talk on the phone anymore? Let’s face it, we’re living in an era of fast communication where everyone texts, tweets, and emails in real time. Immediate response is expected—no, make that demanded. The irony is that in such a written world digital punctuation becomes increasingly important, conveying more about the tone and intent of the person sending a message than the actual words themselves. Yet all the rules and principles of rhetoric established over centuries are suddenly being tossed out the window. Can anyone explain to me the meaning of a row of question marks interspersed with exclamation marks?!?!?!? And don’t get me started on emoji…. In closing, I can’t help but wonder that if a particularly bright star could alert the world to the birth of a new religion then who knows what a semicolon in the sky might awaken in us if we just take time to pause every now and then.